Continuing on my walk down memory lane from this past month's New York Fashion Week festivities, I end my travel diary recap with my last (but not least!) two favorite looks from this trip. Looking back all the pictures from New York and Fashion Week, I love the versatility that I was able to bring to each of my styles and ensembles, making every look I wore on this trip completely different from the last. With this first outfit, I was able to tie in my three favorite pieces into one-- vests, high waisted shorts, and big hats-- creating what to me was a hipster meets fun prepster look. And then of course, my must-have Carrie Bradshaw moment that exceeded all (in my book). 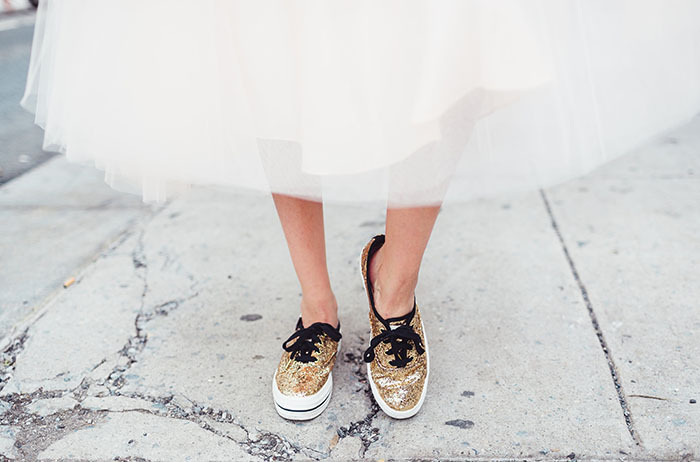 Bringing forth the ever so popular tulle skirts, I decided to pair it with a cute cheeky Cynthia Rowley tee and the most beautiful and glittery Keds of all which to me made for the absolute perfect tutu look. Teaming up with New York photographer Noel McGrath for today's fun photos, this just makes me excited to countdown to my next New York experience.